Soldiers and sailors from many countries are lined up in front of the Allies Headquarters Building. The United States is represented. September 1918. The US Armed Forces and the Red Army, although great rivals, only once met in battle. Even though during the Cold War a number of conflicts were considered to be proxy wars between the two superpowers, it was during the Russian Civil War that the Soviets and Americans fought each other directly. On March 3rd, 1918, the Bolshevik government of Soviet Russia signed a separate peace treaty with the Central Powers, in Brest-Litovsk, thus leaving the war and closing the Easter Front. Immediately, the Allies organized an expedition intended to regroup the Imperial Russian Army and subdue the Bolshevik revolution. Several contingents of Allied troops deployed to Russia. 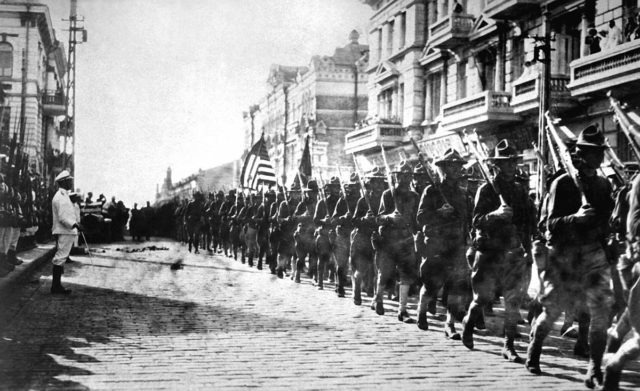 U.S. troops in Vladivostok, August 1918. The British regiment landed in Arkhangelsk, on the far northern tip of Russian coast on August 2nd, 1918, occupying the city and securing it as a base of operations for further actions. The city was of great importance, as it held many supplies sent by the Allies to support the last Russian offensive against the Germans in 1917. By the time the British troops arrived, the supplies had been seized by the Bolsheviks, who engaged the Allies in combat almost immediately upon their arrival. In September that same year, a contingent of American troops was sent to Siberia as a peacekeeping force, but they never saw combat. Some 189 soldiers died from the cold or other causes. All operations in Russia conducted by the Allies were of an international character. Soldiers from different Allied countries were sent to aid the expedition or were already in Russia as part of the Entente war effort against Germany and Austro-Hungary. These included French, Belgian, Romanian, Greek, Polish, Canadian, Italian, Japanese, Czechoslovak, Yugoslav, and Australian soldiers. In fear of communism spreading throughout Europe, the Allies quickly agreed to provide open support for the members of the Tzarist White Russian movement, which hoped to restore the Russian Empire. As the First World War was coming to its end, the Allied attention had shifted to the crisis in Russia. Some units, organized by volunteers and POWs from different ethnic backgrounds, were now stuck in a complicated conflict that was tearing Russia apart. The largest of these divisions was the Czechoslovak Legion, consisted of Czechs and Slovaks, who refused to serve, or deserted from, the Austro-Hungarian Army, in hopes of creating their own state after the war. 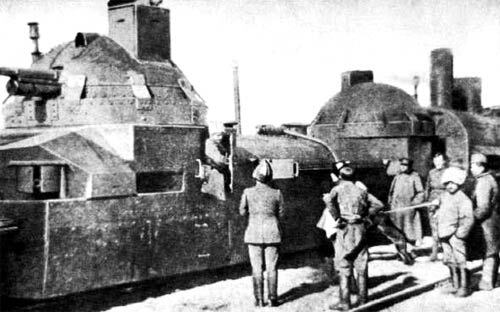 Czechoslovaks with armored train, Russia. One of the main concerns of Allied expeditions was the extraction of 40,000 members of the Czechoslovak Legion, who, at the outbreak of the civil war, assumed control over the strategically vital Trans-Siberian railway. 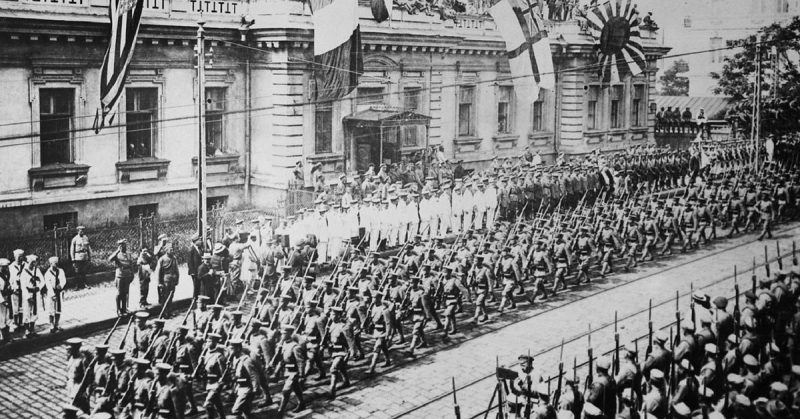 At first, a verbal non-aggression pact existed between the Bolsheviks and the Czech Legion, but in 1918, the Legion became deeply involved in the conflict, siding itself with the White Russian movement. The American contingent stationed in Arkhangelsk was dubbed the Polar Bear Expedition due to the position of the city near the Arctic circle. The freezing weather added up to the nickname, as the soldiers faced extremely low temperatures. Elements of the 85th division were sent by General Pershing to aid the British in Arkhangelsk. The main bulk of the American force was the 339th Infantry Regiment. There were also troops from the First Battalion of the 310th Engineers, plus a few other ancillary units from the 85th Division. The Americans arrived in Arkhangelsk one month after their British counterparts and joined the fight as the British fought their way through to reach the remnants of the Czechoslovak Legion. A far-fetched objective was to restore the Eastern Front with the help of the Czechoslovaks and White Russians as the war was still happening at that time. 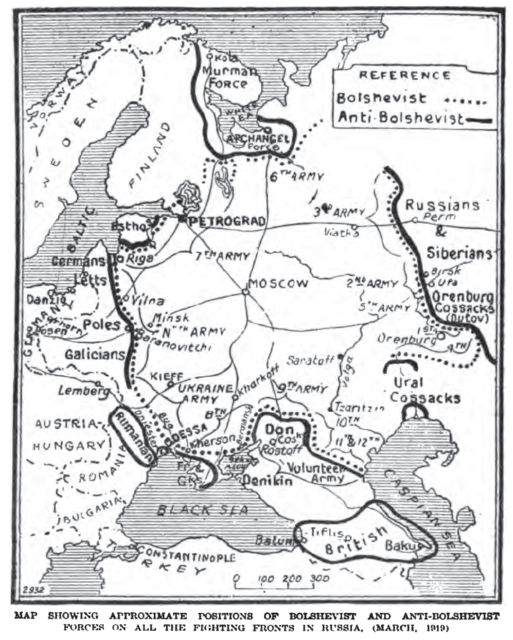 The positions of the Allied expeditionary forces and of the White Armies in European Russia, 1919. War opened on two fronts, one along the Dvina river and another along the Vologda Railroad. Here, they engaged and pushed back the Bolshevik forces for the next six weeks during their autumn offensive. The fronts were becoming too long and far too difficult to supply. The vast plains of Russia weren’t compatible with the trench warfare the army was accustomed to in Europe. In the east, cavalry still represented an important element of war, and a skilled rider was indeed a formidable foe. It was hard for the Americans to keep their front line and enemy raids began to disrupt their supply routes more frequently. Soon after, Germany capitulated. The word spread that the Great War, the biggest of them all, was over. Everyone felt homesick and with a sense of pointlessness as the soldiers weren’t fighting for the Allied cause in general anymore, but were becoming more and more involved in a complicated civil war. Also, the number of casualties was growing. Mutiny was in the air, as the men demanded to return to the USA. The port of Arkhangelsk froze over during the winter months of early 1919, and the soldiers were losing all hope of ever seeing home again. The men from the 339th Infantry Regiment were mostly from Detroit, Michigan. Finally, in May 1919, 4,000 British volunteers were sent to relieve the American troops at Arkhangelsk. Soon, the US contingent was evacuated, together with the rest of the Allies stationed in Northern Russia, thus ending the intervention. Polar Bear Monument in White Chapel Cemetery, Troy, Michigan, by sculptor Leon Hermant. Photo Credit. A report dated October 1919 stated that there were 210 American casualties, including at least 110 deaths from battle, about 30 missing in action, and 70 deaths from disease, 90% of which were caused by the Spanish Flu. The number of wounded men from the Polar Bear Expedition was 305. The repatriation of the remains of American soldiers was a long and tiresome process because of the extremely difficult diplomatic relations between the USA and the Soviet Union, especially during the first years after the war. 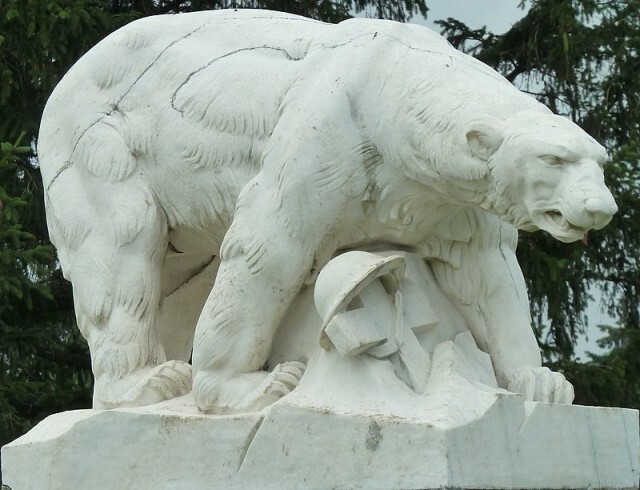 The remains of 56 soldiers, the last to be returned home, were eventually re-buried in plots surrounding the Polar Bear Monument – made by sculptor Leon Hermant – in White Chapel Memorial Cemetery, Troy, Michigan. A ceremony was held on May 30, 1930, to commemorate the event.